Andaz San Diego is located in the heart of downtown San Diego's Gaslamp Quarter. Located about a mile from North San Diego Bay and the USS Midway Museum, this particular location makes most areas of downtown San Diego very walkable. Let's talk about vibrant meets modern and chic. The Andaz San Diego just unveiled a $4 Million Dollar rennovation in the spring of 2017. Perhaps one of our favorite things about the Andaz properties is you are surrounded by local arts, culture and food. During the renovation, a different piece of local art was sourced for each and every guest room, giving each space it's own unique look and feel. All 159 guest rooms and suites underwent upgrades. And trust us the renovation turned out great! The Andaz San Diego looks very sleek from the outside and that continues as soon as you enter the hotel. 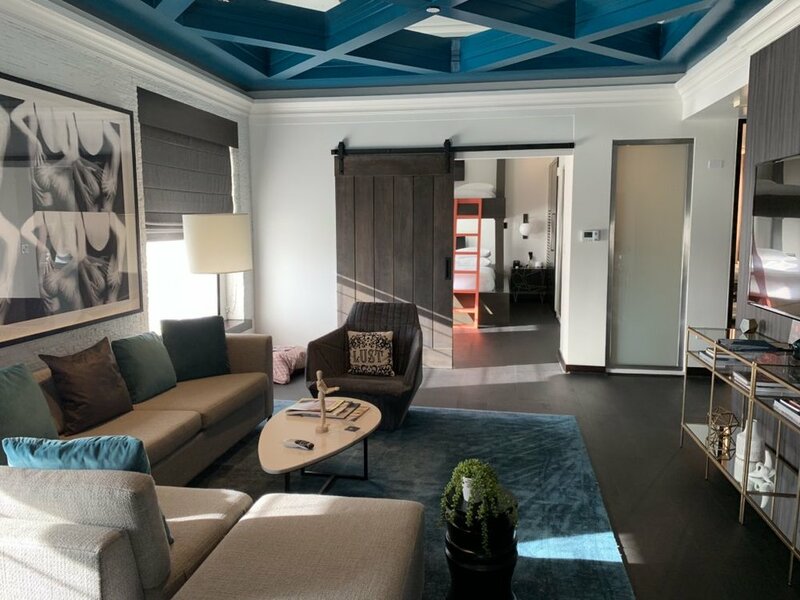 The Andaz San Diego gives you the feel of a smaller boutique hotel But you'll also get the amenities and location of your typical larger chain hotels. The rooms are very art-centric with several paintings, photographs, sculptures and a variety of textures give the rooms a fun chic vibe. The rooms feature a pretty neutral color palette of grey and white with pops of color in the furniture, accent pillows and trim work. We stayed in the Star Suite. And it's incredible with two bedrooms (1 had full-size bunkbeds), 2 full bathrooms plus a living and bar area. The room featured sleek modern surfaces with industrial light fixtures and colorful textiles tying it all together. And if you happen to bring your four legged friend, the Andaz San Diego is pet friendly. They don't even charge a pet fee like most hotels typically do. And they will roll out the red-carpet for your pet with a bed and food & water bowls. We are already planning another trip back next month and Madi is definitely coming with us! Be prepared to step into the modern age in this spa like bathroom. You'll be surrounded in lots of glass, metal and shiny surfaces. Both bathrooms featured large walk-in showers and had a modern-sleek feeling to them. The master bathroom also featured a steam shower, which was quite nice! The shower enclosure in the master bathroom also featured a large free-standing tub, oh and don't forget the fun gold duck. The on-site restaurant at Andaz San Diego is not your typical local inspired restaurant. Instead the Andaz San Diego opted for a restaurant that matches the vibe of the hotel. And STK knocks it out of the park! STK puts a modern twist on your classic American steakhouse food. The ambiance is very dark, fun and romantic with club like music and candles on each table. Steak lovers rejoice, the steak was some of the best we've ever had. Seriously. 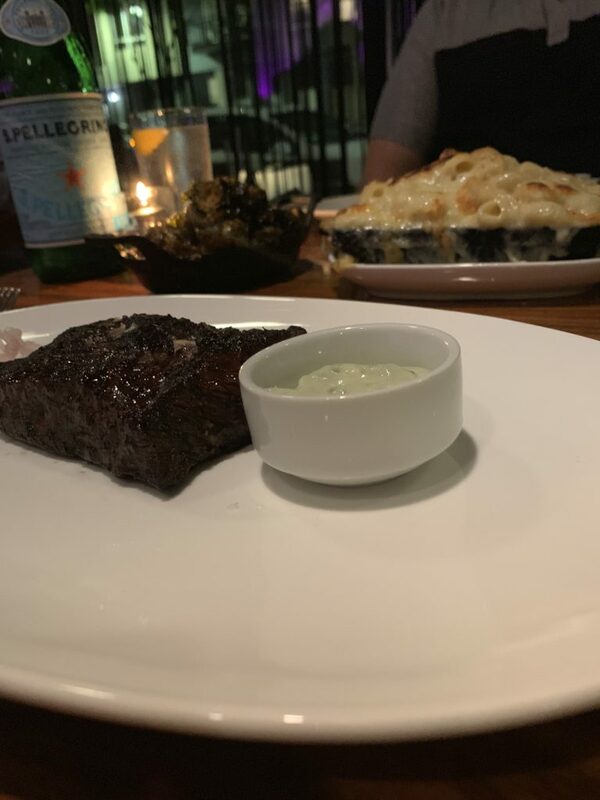 We can't wait to go back, just to dine at STK! 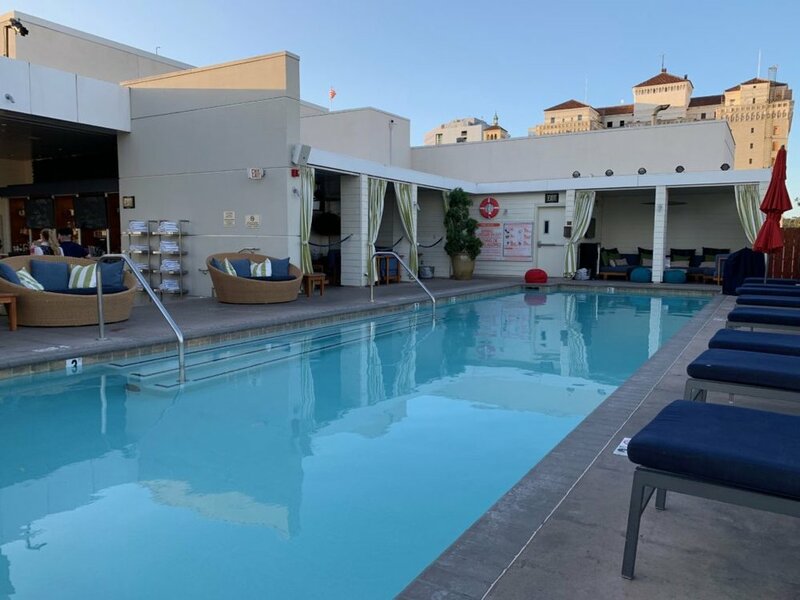 There are plenty of amenities at the Andaz San Diego such as the Gallery (art gallery), fitness center and the incredible rooftop bar & pool. If you want to watch the sunset head up to the rooftop for a cocktail or a dip in the pool. Due to the short duration of our one-night stay at the Andaz San Diego, we weren't able to take advantage of the fitness center. But we did check it out, and it would definitely suffice to get a good workout in. There are plenty of free weights and cardio equipment to get your sweat on. And remember, if you book with a travel agent like Virtual Travel Gurus, you’ll get extra benefits like complimentary breakfast, a $100 food & beverage credit, room upgrade, early check-in and late check-out!